In today’s Sunday Gospel reading, which is the familiar and much-loved “Parable of the Lost Son,” we see some kind of precursor to social media envy in the elder brother, the one who, at the end of the parable, is keeping his distance from his brother’s homecoming party. Today it would be like him checking his Instagram at the end of a day’s work–only to see a selfie of his younger brother’ posting, showing off his brand new ring and robe, and feasting on that fattened calf! 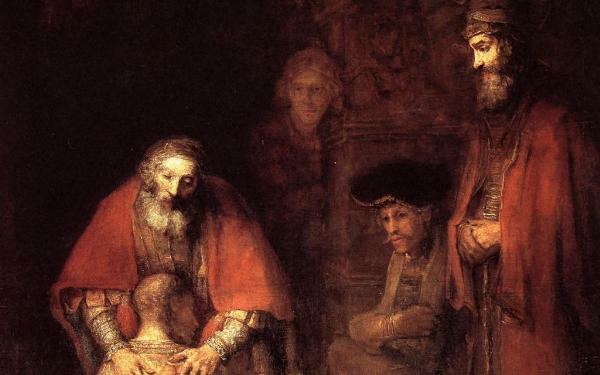 If you look at Rembrandt’s famous painting of the parable, you will find him there in the center, but hiding in the shadows looking on with disappointment and resentment. I couldn’t help noticing the stark differences between him and his elder brother. The elder brother is everything the returning son isn’t. The elder brother is obedient, responsible, and hardworking, while the lost son is none of the above. His brother sounds like the person who is hard on himself, while the younger son goes notoriously easy on himself, making decisions based on his every whim and pleasure. I have to say that I so get the elder brother. I can’t blame him for being disappointed and even resentful when he comes home from a hard day’s work only to find a party thrown in his long-lost brother’s honor. What for? Why reward someone who has done nothing but indulge himself, spending away his father’s inheritance? Why give that son the ring and the robe, and why kill that fattened calf just to welcome him home? Where’s the logic or the justice there? We don’t know what the elder brother actually does because the parable ends with the father’s plea. Does he decide to continue with his tantrum–or does he allow his father’s words to convince him to join the celebration? The parable does not offer an ending because Jesus intends the entire parable as a question or an invitation to the pharisees and scribes who have been critical of the “sinful” company that Jesus keeps. They are the elder brothers who need to make a decision whether to continue nursing their resentments or to let that go and share in God’s joy in the sinners’ repentance. I remember what Fr. Benny Calpotura, one of my novice masters, said about the elder brother years later. The problem with the elder son, he told us novices, is that he is looking at things from the lens of duty and entitlement. Even if he is a son, he still thinks like a slave. Everything his father has is his–and his younger brother’s, a gratuitous gift given to both of them, regardless of how their merit or their sins. It’s a difficult pill to swallow for those who are striving to behave properly and perform their duty. For me, the message of the Gospel is: Will I choose to think and act like a slave, and calculate things according to what I think I deserve? Or will I try to respond to God’s invitation to think and act like His child, who receives everything as an undeserved gift? We are invited to make that shift; it’s a shift that the Pharisees and Scribes failed to make. What about us?